When we were still in the Philippines, I would take a bath at least once a day. During summer days, I would take a bath two to three times a day. For anyone who has experienced the humidity of our tropical country, they would understand. When I came to Canada, I learned that taking a bath, taking a shower, and washing your hair meant entirely different things. I would still take a shower, at least twice a day, but it didn't automatically mean that it included washing my hair. Over time, I found out that washing hair everyday is not the most practical thing to do, especially for those with long and thick hair like me. It takes time to blow dry and style. One can never leave the house with wet hair, for fear of it freezing. (I was warned of this when we first arrived). Also, my hair became overly dry because of daily shampooing. So I started washing my hair at night, every other day. At night I am not rushing to blow dry my hair, and in the morning I would just iron my hair or add a leave in conditioner to let my curls free. I noticed that my second day hair would be oily. Upon searching the wonderful world of YouTube beauty bloggers, I learned of the impressive invention called dry shampoo. Of course I realize that this is nothing new to our first-world friends, but it was an entirely new concept for me. 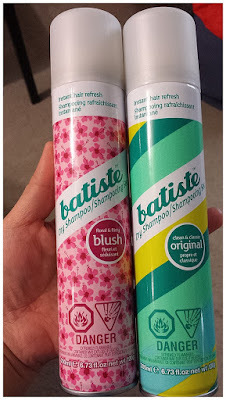 I found a drug store brand that is not the cheapest, but apparently works wonderfully, the Batiste Dry Shampoo. It came with different scents and for different colours of hair. I tried the original and blush variety. 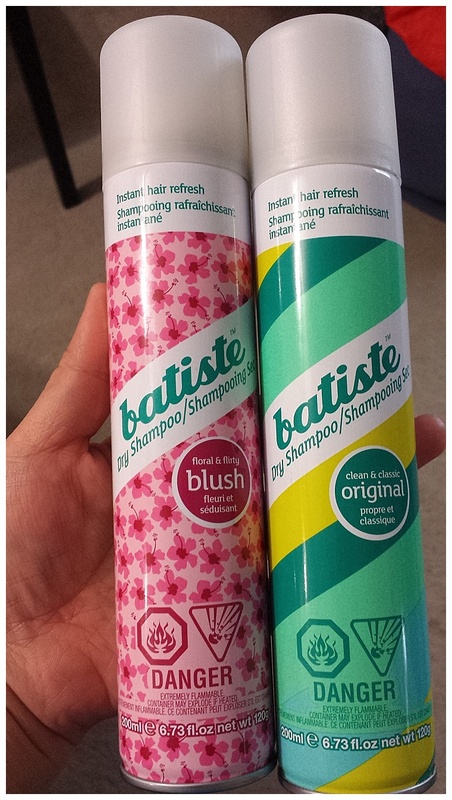 Although I thought Blush smelled nice, I found it to be too overpowering for my taste. So I decided to stick with the Original. Application is really easy, just spray on hair near the roots, and massage into hair to absorb the oils. After a minute, brush hair to remove powder residue. Ta-da! Fresh-smelling, oil-free hair!